On March 27, the European Parliament, in its Strasbourg session, passed a controversial censorship directive, purportedly aimed at protecting copyrights in digital markets. The draft was passed with a vote division of 348 votes in favor, 274 against and 36 abstentions. The directive now awaits final approval in the Council of the European Union and will be operational within two years, if it is approved. The decision was met with protests by political parties and digital rights groups across Europe. According to reports, the new rule will hold tech firms like YouTube, Facebook, etc. responsible for material posted without copyright permission. Critics of the legislation point out that these companies will enforce filters which will lead to the curbing of freedom of expression online. Even though a section of artists and creators argue that the legislation will compensate them fairly, a large section of experts and activists argue that the new legislation will destroy user-generated content. Tens of thousands of digital rights activists marched in various parts of Europe on March 23, 2019, protesting against the proposal for digital censorship. Protesters raised serious concerns against the Article 13 (replaced as Article 17 in final version) in the legislation which stipulates that nearly all for-profit web platforms that permit user uploads should install copyright filters and censor content. Serious criticism has also been leveled against Article 11 that stipulates a ‘link tax’, whereby news aggregators must pay publishers for linking to their stories. Esquerda reported that around 100,000 people participated in the various demonstrations across Europe. In Germany, marches were held in cities such as Munich, Dortmund, Karlsruhe, Hanover, Berlin, Frankfurt, Hamburg, Cologne, Stuttgart, Erfurt, etc. Julia Reda, MEP (Member of European Parliament) from the German Pirate Party who led much of the opposition to the directive, said it was a “dark day for internet freedom”. In Poland marches were held in Warsaw, Bielsko-Biała, Debica, Gdańsk, Katowice, Krakow, Poznan, Lodz, Wałbrzych, Wrocław and Bełchatów. People joined the marches held in the Austrian cities, including Vienna, Innsbruck, Salzburg and Graz. The Czech Pirate Party and others organized marches in the cities of Prague, Karlovy Vary, Brno, Pilsen, Ústí nad Labem, Ceske Budejovice, Liberec, Hradec Kralove, Pardubice, Jihlava, Ostrava, Trebic and Olomouc. Marches were also held in Brussels, Amsterdam, Rome, Paris, Helsinki, Ljubljana, Tallinn, Lisbon, Athens, Thessaloniki, Nicosia, Luxembourg, Zurich, Stockholm, Barcelona, Glasgow (on March 24), Bucharest and several other Romanian cities. #SaveYourInternet! campaign had provided an online platform for the people from March 20 to 27, as part of the Copyright Action Week, to persuade their respective Member of European Parliament (MEPs) to vote against the law. They said that with this law, “users will have access to less content and will be unable to share their content with others, even when it’s legal. Moreover, any complaint mechanisms will be easily bypassed if blocking is done under the pretense of a terms and conditions violation, rather than as a result of a specific copyright claim”. “If platforms become directly liable for user uploaded content they will arbitrarily remove content based on their terms and conditions. As a result, many creators will see their content get blocked too. And, as less platforms survive the burden of this provision, creators will have less choice on where to share their creations,” the campaign said. Campaign group STOP ACTA2 warned that the new law, once enforced and operational, could be used by the regimes to filter and block any kind of content and there would be no going back. The group said that it is true that today’s copyright laws are not great and need a change. But this sort of a change is leading to an authoritarian system, it added. The Euro-Parliamentary group of the Communist Party of Greece (KKE) said that EU’s Digital Rights Directive in the Digital Single Market neither meet the contemporary needs for copyright protection nor the rights of the internet users. In any case, its aim is to create more favorable conditions for profitability for European monopolies in the fields of audiovisual works, publishing and the press, it added. Marisa Matias, MEP from the Left Bloc in Portugal, said that “Article 13 does not help the authors at all, but introduces a censorship mechanism that affects everyone who uses the digital space”. The Slovenian left party, Levica, said that the copyright directive in the single digital market is unclear and is the result of lobbying among large publishers and online giants. The Communist Party of Austria (KPO) conducted a vigorous signature campaign against the new European Union legislation. KPO had said Tuesday was a gloomy day for the internet users as the EU Parliament gave in to the demands of lobbies and corporations. KPO also condemned the Austrian MEPs from Austrian Freedom Party (FPO) and Peoples Party of Austria (OVP) for voting in favor of the legislation in the EU parliament. In response to the vote, Creative Commons CEO Ryan Merkley noted that “Despite an incredible show of public opposition to the directive, and an abundance of evidence that the proposals will favor large rights holders, damage online communities, slow or even stop innovation, and entrench established big tech players, the European legislature has decided to approve it”. Earlier in September 2018, European Parliament had voted with a division of 438 MEPs in favor and 226 MEPs against (with 39 abstentions) to approve drastic changes to copyright law to extend more rights to the establishment copyright industries while failing to protect users and new creators online. Hey Buddy!, I found this information for you: "Widespread protests mark passing of European ‘internet censorship’ law". 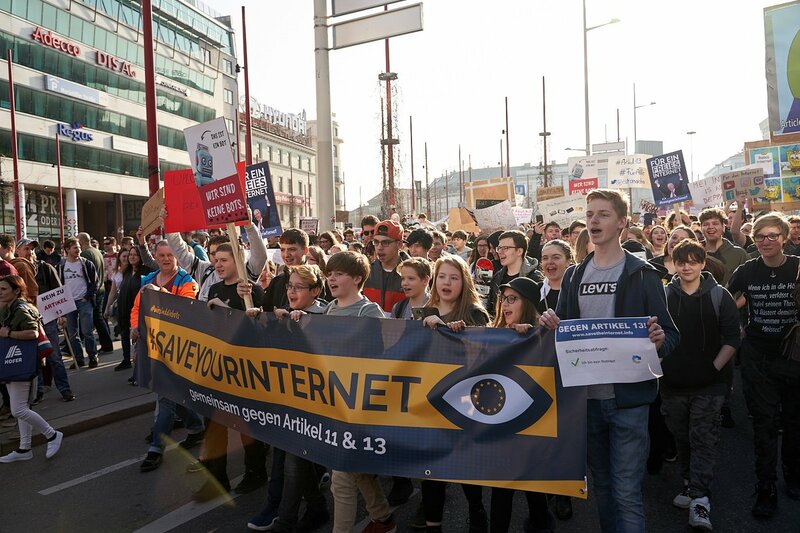 Here is the website link: https://peoplesdispatch.org/2019/04/01/widespread-protests-mark-passing-of-european-internet-censorship-law/. Thank you.